The Origins of Forcegrowth, Darkgrowth and SurgeSpawn. Description: As big as a house, as black as a beetle, and as hungry for tanks as one insect could ever be. This eight-legged monstrosity is commonly seen surrounded by a hardened exoskeleton of Terminus Barab Armor. The Tank Eater can be orange, red, or yellow but in a rare twist for hive species, it is most often black. Its body has an excess of fluids to help keep it cool from a large amount of magma it carries in its stomach and throat. While its eyes are blue when at rest, they take on an orange hue when hunting or spotting creatures via their heat signature. Skin color: Black, Orange, Red, Yellow. Distinctions: Tank Eaters as their name implies are suited for eating tanks. Burrowing like beetles they love heat, and they love hunting by vibration and heat. Especially gifted at tracking heat sources from vehicles, large groups of people or other predators even at night. It likes nothing more than coming underneath tanks, structures or large groups of enemies and chewing them to pieces. Other times you'll see it skittering over the surface with the Surge. Skittering is a nice way for saying a two-story house is moving on eight legs toward you and spitting a stream of magma as wide as a tank. The ground will shake, the tanks will be eaten and the enemies of the hive will burn. Now when's lunch? 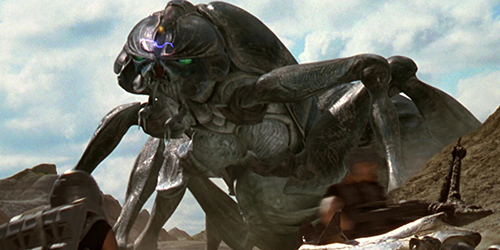 Like the Kubaza Beetle they were bioengineered from, the Tanker bug will explode in a shower of magma when killed. Meaning its charges into enemy formations are not just terrifying but deadly. When this thing appears, it's one of the creatures you want to be shooting first. If you hear it underground, focus fire! Spits tank sized magma streams up to 120 meters. Temperature. Regulates Heat, Gives Off Heat, Can Survive in Magma temperatures and help fuel hive structures that need magma to operate. Carrying magma means cold doesn't affect this bug much either. Eats Tanks! Hunts by vibration and heat, doing so well at night or in the day. Can take a larger tank shot. It's bioengineered to be the creature that deals with tanks. 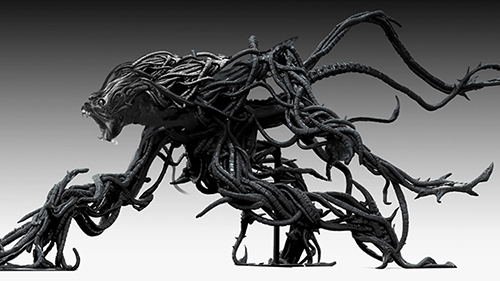 Underneath the Terminus Exoskeleton, its own natural body is absorbent and resilient. Explodes when near death, sending a magma shower 25x25 meters wide. There are about five seconds of warning, it begins to shake, the cooling fluids in its body evaporate and the creature explodes outward. Fearless. The Hive's Mind, The Swarm's Will and the Surge Impulse control this completely. Small arms fire does better against this creature. Concentrated smaller shots finding gaps in the armor that larger munitions cannot hit. Whereas large projectiles and larger energy shots are going to have a harder time unless they are pinpoint weapons. Explosives might do okay, in this case, fragmentation is better than piercing. Magma sounds great. Until you realize magma burns most things, including other hive creatures. Exploding magma can harm every hive creature nearby depending on its heat resistance or armor. Inside the mouth, if it opens to spit fire, it is a good spot to throw a grenade. Slow to heal. Due to its immense heat and a large amount of bodily cooling fluids rather than tissue. This creature doesn't heal quickly on its own. There are Hive buildings or creatures to help negate this weakness but it doesn't help on a battlefield often. Can be misled by moving heat signatures or vibrations elsewhere. This instinct can override regular Swarm Will, just not hive mind's direction, which is much rarer for any one creature in a surge of thousands. If topside. It isn't very hard to hit the thing, or see it coming, even if finding a specific weak spot takes more effort or a closer range. 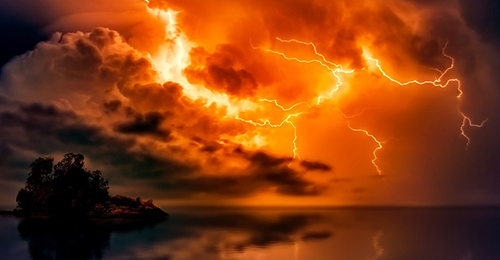 Communication: Magma Signs, Body Language, Sight. The Hive's Mind, The Swarm's Will. Religion/Beliefs: The Hive Mind, Build. The Swarms Will, Exist. The Surge Impulse, Expand. 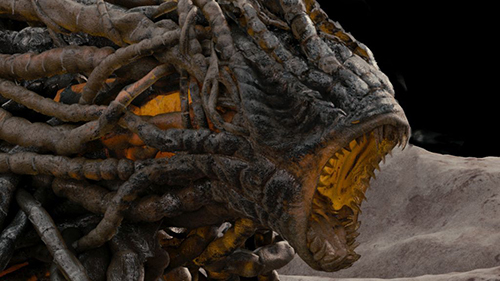 General behavior: The Hive uses these large creatures to eat tanks and hunt vehicles across the ground. It also uses them to burrow from time to time and often clear out blockages. In fact most of the food it eats it finds as it goes about its duties, maintaining tunnels made by larger Surge Worms. If left to its own devices, it will probably nest in a tunnel, breeding once every 5 years if it can find the opposite gender. The Hive likes Mustafar for the heat. Shame nothing ever grows there for it. 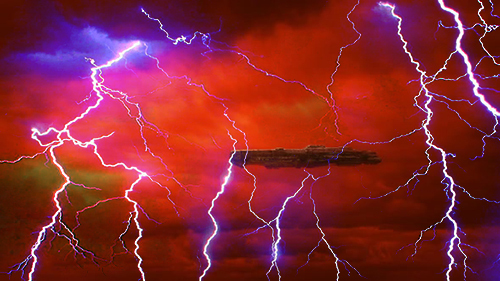 Nothing from Mustafar integrated into the hive when they engineered the first magma creature and still nothing has now. All the Hive has been able to do is harvest DNA. Which it keeps doing. Collecting what it can for integration, and creating two genders for self-sustaining populations going forward. Tank eating bugs are a new concept to counter the larger dead metal the hive has encountered. Although not very nutritious, they do still make tempting meals for these creatures who hunt them for their heat and vibration. A good thing to charge a tank or artillery line with and take some of the fire. They stand out as big targets, and you want to kill them fast because of their explosive reaction, so it's not a bad plan. Only it can be wasted fire better saved for when they are closer for infantry, only more dangerous as a result. It has used these creatures a few times now to breach structures or clean out any dead Surge Worms in tunnels, which its magma is well suited for. In fact other than heating hive structures and refueling them at times with its magma, it is well suited to removing any kind of blockage in a hive tunnel, interlinking Hive connection, or passage to the site of any surge. Wildgrowth. Your part-time enemies, part-time friends. Useable in threads, but never fully under your control. Found around hives or sometimes lying dormant near their vines. Often at the front of surges, pushed out ahead of them from the impulse. Think of consciousness expanding and wild growth being at the edges of it.